WASHINGTON, OCT. 12, 2016: TCG, an award-winning IT solutions provider, is ranked No. 4 Best Medium Workplace in the country by the Great Place to Work® Institute. The company was recognized at the Small & Medium Business Conference & Awards Gala in Austin on October 11. “TCG is a great place to work because of the great people who have joined TCG. It’s reassuring to know that as the company grows and our teams get larger, we are able to maintain our culture, uphold our core values, and support our employees’ lives,” said TCG President Daniel Turner. 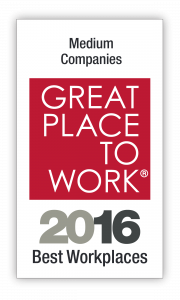 In July 2016, TCG was certified as a Great Place to Work®. This is the company’s first time ranking on the Best Medium Workplace list.